The 2015-16 NHL Regular Season comes to an end on Sunday with one game that could determine the final playoff team in the Eastern Conference – Philadelphia taking on the New York Islanders – and one that could be a preview of the Stanley Cup Finals, Anaheim at Washington. Before the playoffs begin and postseason performances alter opinions, here’s a look at who should be taking home the various yearly honours the NHL will hand out after hockey’s holy grail has been won. Kane is going to get the award because he was on an offensive tear from Game 1 and is the only player in the league to crack the 100-point plateau, plus his team is headed to the playoffs again, where they remain the club no one wants to cross paths with at any point in time. He’s been outstanding, making up for the loss of Patrick Sharp and Brandon Saad while raising his game amid serious off-ice distractions. Even though there is already an award for the guy that gets the most points each year – the Art Ross Trophy – Kane’s prowess at accumulating points will likely earn him the nod as the league’s most valuable player. The sentimental choice, though, would be to give the award to Jaromir Jagr, who has been the veteran leader (and leading scorer) of the upstart Florida Panthers. Here’s a guy that was out of the league for multiple years and wasn’t all that keen on being sent to Florida last season, turning back the clock (again) and leading the kids to the playoffs way ahead of schedule. There is really no one else that should take home this award. 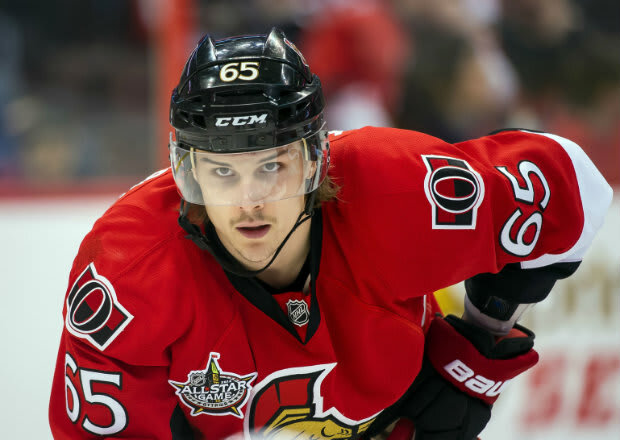 Karlsson is fourth in the league in scoring, but it’s the fact that he’s been so impressive on such an utterly mediocre club that cements this for him. It would be scary to see what the repeat winner could do with a better supporting cast. Drew Doughty of the Los Angeles Kings has been the best non-Karlsson defensemen, but might end up being that guy who never wins the award because he’s playing at the same time as a generational talent. Bishop has delivered the most complete season of any of the standout goalies this year, ranking in the Top 5 in wins, goals against average, save percentage and shutouts while playing 60 games for the Bolts. Everyone else in the running – Braden Holtby, Henrik Lundqvist, Corey Crawford, Jonathan Quick – has a weak spot in the numbers, while Bishop has just been really steady and ready damn good all year long. Conor McDavid’s injury took the top overall pick out of the race, although he’s still fourth in rookie scoring, which shows how talented he is, leaving Panarin and Flyers defensemen Shayne Gostisbehere as the top two Calder candidates. “Ghost Bear” has been a great story and came out of nowhere to become one of the top young defensemen in the game, but Panarin will take home the hardware. He’s been the leading scorer among rookies all year and more importantly, he’s an integral part of Chicago’s second line, having the kind of impact many expected from Teuvo Teravainen. Make it a three-peat and four trophies in five years for Bergeron, who has delivered another exemplary season in Boston. The NHL 15 cover athlete is one of the best two-way players in the game and should even get some Hart consideration given the year he’s had with the middling Bruins. Trotz could have won last year, but Calgary’s Bob Hartley got the nod because the Flames got every favourable bounce imaginable in making the playoffs. That luck has been regressed to the mean this year and you see where they’re at. Meanwhile, Trotz has turned a historically frustrating team that didn’t particularly care about defensive zone assignments into the President’s Trophy winners and a 55-win club a legitimate chance at winning the Stanley Cup. He should be rewarded for his efforts.